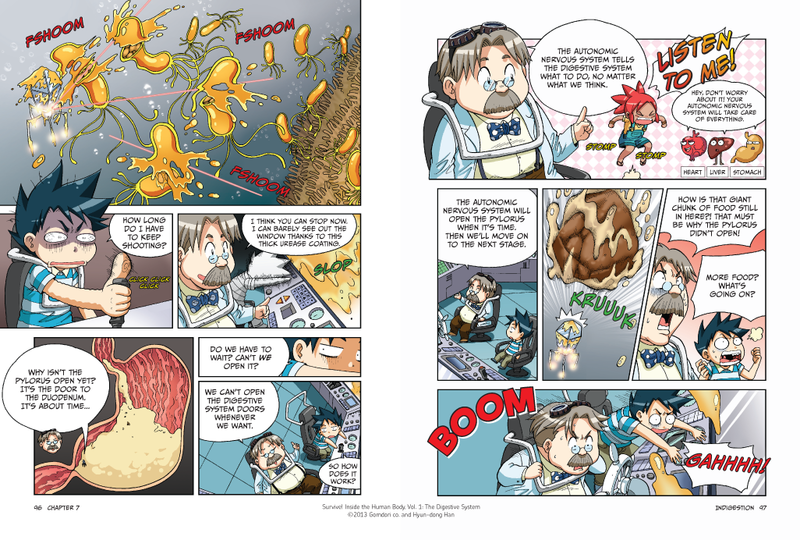 "From volcanic burps to colonic bacteria, this comic-book ride through the human digestive system is a delirious joy." "Abundant scientific information in a format that is appealing and exciting." Survive! Inside the Human Body, Volume 1 begins an epic journey through the human body with a look at the digestive system. 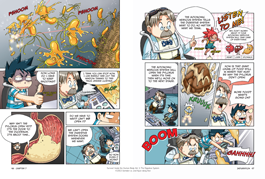 This lively, full-color science comic explores Phoebe’s insides after she accidentally swallows a microscopic ship. The only problem? Dr. Brain (the ship’s eccentric inventor) and Phoebe’s friend Geo are on board! Geo and Dr. Brain must avoid danger at every turn—like hazardous stomach acid and feeding parasites. (Ew!) Will they escape? You've got a front-row seat as they travel through Phoebe’s esophagus, stomach, and intestines. How our bodies break down food and absorb nutrients? How the stomach protects itself from its own acid? How doctors cure patients who have parasites living in their digestive systems? Why we have trillions of friendly microbes living inside of us? Gomdori co. gathers expert writers from various fields to create fun and informative stories for kids. Survive! Inside the Human Body was written by Suk-young Song. 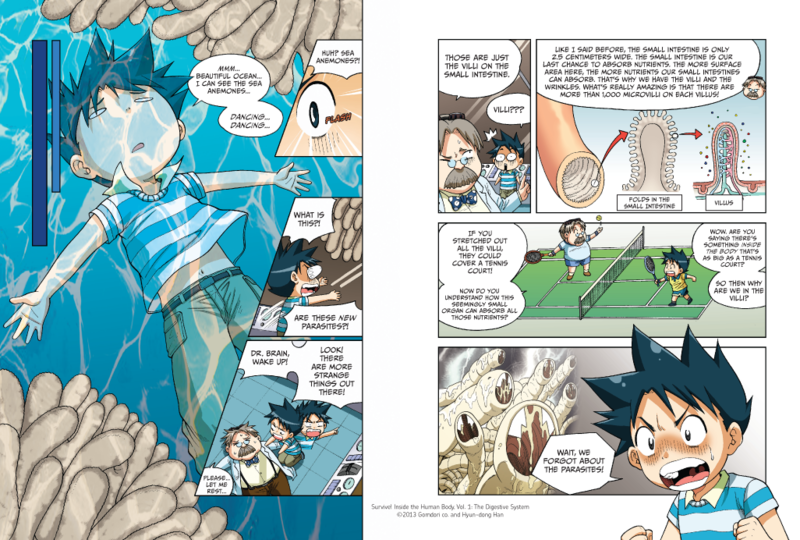 Illustrator Hyun-dong Han studied manhwa (Korean comics) at the Department of Cartoon Art at Kongju National University. His debut series New Tales of the Nine Tailed Fox ran for six years and he’s well known for his work on Ghost Tunes and the Survive! series. 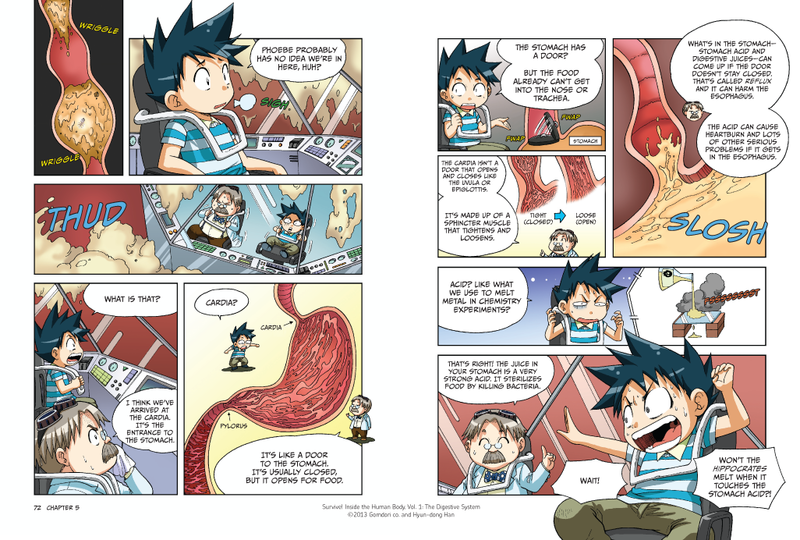 Chapter 11: Into the Large Intestine! "The madcap plot and near-constant gags (no pun intended) deliver educational content in an entertaining fashion." "An educational triumph. It’s smart, it’s accurate, it’s comprehensive, and above all, it’s actually fun—a concept so many popular science books aim for, but so very few achieve." 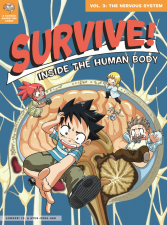 "The science is detailed and accurate and presents the workings of the digestive, circulatory and nervous systems in a way likely to appeal to young minds." "This series is a fantastic reference for readers and educators seeking a clever fictional framework for learning science." 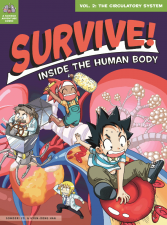 "In a mix of comic-book panels and print, a wild ride through the digestive system is positively clogged with scientific information." 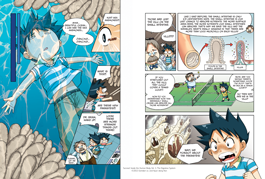 "Scientific information embedded in a deeply engaging story with fun characters and beautiful artwork, all wrapped together with silliness and humor, these books are perfect for a budding scientist who loves comics, or an adult who wants a fun read on the metro ride to work." "Outstanding. Fast-paced, light-hearted, and fun. It’s all about the discovery and adventure!" "If you've got kids that are always curious and looking to learn new things, these are three gems that absolutely must be on your bookshelf."